Share the love this season with the beautifully bright and finely detailed Christmas mantel: 3 grandkids love to grandparents tabletop personalized Christmas ornament from Russell Rhodes. 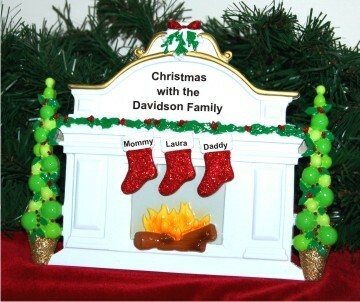 One of the prettiest grandparents ornaments personalized for added significance, it is designed for flat surface display rather than the tree. The Christmas mantel with stockings 3 grandkids personalized Christmas ornament will find a special spot in their hearts as well as on a table, desk or shelf where it can be enjoyed throughout the holidays.